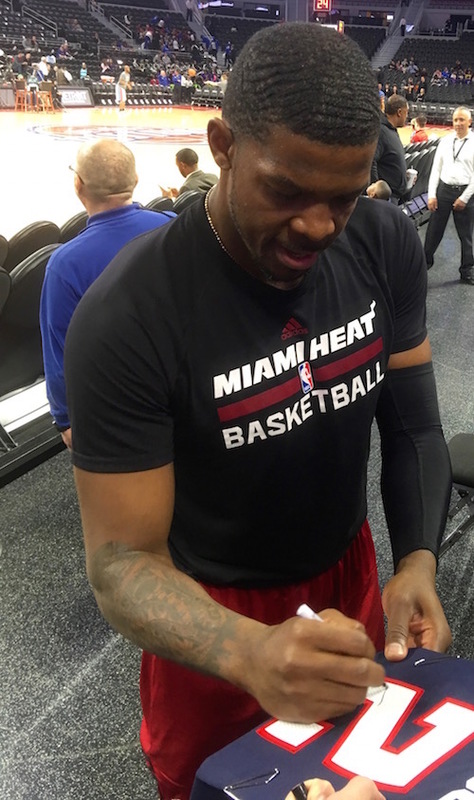 At the end of the regular season, Michigan based iFolloSports.com correspondent Lance Martinez captured this original photo of Heat guard Joe Johnson signing autographs, prior to a Heat versus Pistons contest. A Joe Johnson autograph remains a big deal to NBA fans. Johnson, who was originally drafted by the Celtics, is surprisingly in his 15th NBA season. The Arkansas alum has bounced around the league, spending seven years with the Hawks, before being dealt to the Nets in 2012. After four years in Brooklyn, Johnson and the club agreed to a buyout this past February, with the 34-year-old signing with the Heat shortly after. The seven-time All-Star is a career 16.9 points a game scorer. Currently, the Heat trail the Hornets 3-2 in their first round series, after being up 2-0. Johnson is averaging 11.0 points and 4.4 rebounds per game. Fans can check out other iFolloSports.com behind the scenes looks at Joe Johnson, gathered over the last few years.